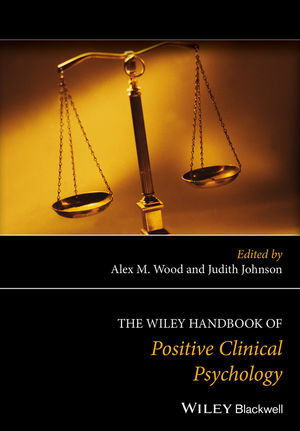 Edited by the founder of the field, this is the first handbook on positive clinical psychology—a revolutionary approach that places equal importance on both the positive and negative aspects of mental health and well-being. Alex M. Wood is Professor and Director of the Behavioral Science Centre at Stirling Management School, University of Stirling, UK. He is also Honorary Professor in the School of Psychological Sciences at the University of Manchester, UK. He is credited with founding positive clinical psychology, and he has published more than 100 papers related to well-being in leading journals across psychology, medicine, and economics. He guest edited the special issue of Clinical Psychology Review that first introduced positive clinical psychology to the mainstream. Judith Johnson is a Clinical Psychologist and Lecturer at the University of Leeds and the Bradford Institute of Health Research, UK. Her research is focused on understanding and supporting the development of wellbeing and resilience, and how this can be applied in healthcare settings to improve treatments and service delivery. She is co-editor of Case Formulation in Cognitive Behaviour Therapy: The Treatment of Challenging and Complex Cases (second edition, 2015).